A few weekends ago, I made myself a pincushion. Easy, I took 2 rectangles cut them in half, rotated them so all the large ends were close together, and sewed them together. 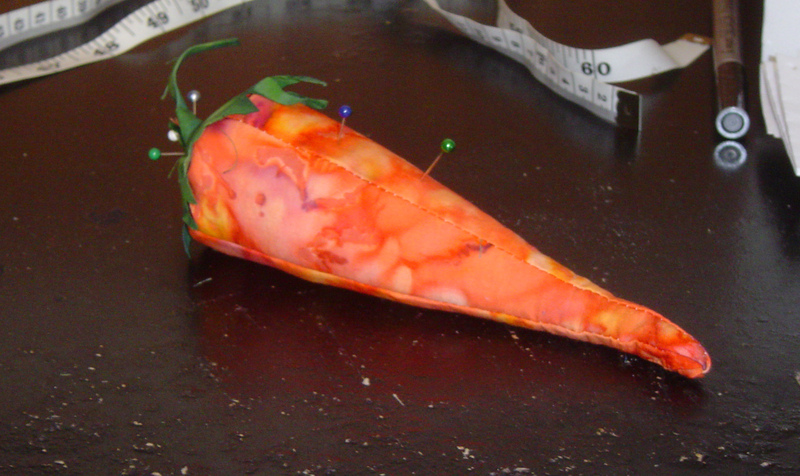 I had a heck of a time with the bottom, had to rip part of the seam & sew it with orange thread. The little walnut shells fill this up nicely. I have a handle on the top for easy grabbing. Only problem is that the smaller section is shorter than my pins. Very cute! I love homemade pin cushions and I’m going to try to make one for myself! Like it! Why should tomatoes get all the pins?